The following article was written for the Fall 2012 issue of Shelterforce magazine. Click here to view the original version on their website. You are never finished. That is one of PPS's 11 principles for creating great community places. For anyone working to create a great “third place” in their neighborhood, it is critical to remember that there will never be a time when the work is done. Real-world communities are incredibly dynamic, ever-changing things. 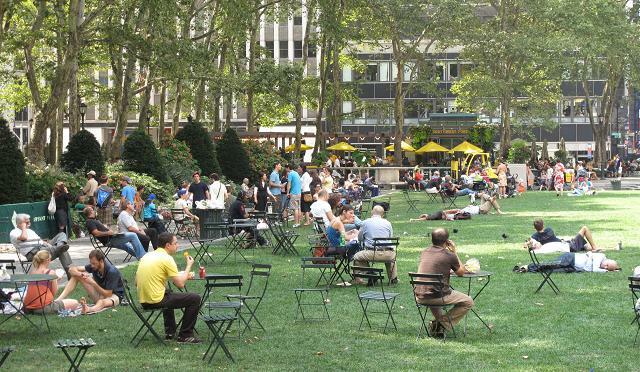 A public space cannot be finished any more than the city in which it resides can be. At their best, public spaces are the most tangible reflections of cities and neighborhoods and the people who make them special. They are stages for public life, and should reflect the people who live, work, and play nearby. “Ninety percent of success in public spaces is about management,” says Fred Kent, PPS’s founder and president. “Lots of cities create spaces but don’t manage them.” The key to successful management is understanding and being responsive to the people a space currently serves. Since people come and go, great places must be understood as sites that are in constant flux. Placemaking, the process that PPS uses in our work with communities around the world, is designed to involve people directly in deciding how their public spaces will look, feel, and operate. Normal citizens are the best experts that you can ask for when planning how a place should be designed or used—but they often question or ignore their own intuitive knowledge. For far too long, the shaping of public spaces has been left to architects and urban planners, who plan from the top down. Placemaking teaches people how to evaluate places based on sociability, accessibility, uses, and comfort, and helps them to articulate and build confidence in the value of their own observations about how a place is working—or not working, as is often the case. In this way, Placemaking is a fundamental part of any attempt to create a local third place, since it simultaneously ensures that changes to a space will reflect the needs of the existing community and builds that community’s sense of ownership in a project. Privately-owned third places like neighborhood cafés or pubs are forced to be responsive to the local community; if they aren’t providing programming and services that their neighbors want, they will most likely go out of business. Public spaces, by the very nature of being publicly owned and operated, can shirk responsibility if the community does not feel either empowered to make them their own or hold local leaders accountable. The Placemaking process encourages people to connect in public spaces, creating the kinds of engaging and memorable third places that anchor strong communities. Pittsburgh’s “Golden Triangle” is a central business district located at the convergence of the Allegheny, Monongahela, and Ohio rivers. At its heart sits Market Square, roughly one and a half acres surrounded by historic warehouses and glassy skyscrapers, historically one of the primary marketplaces for the region. Sadly, the solid old Diamond Market building that filled the site was demolished in 1961, when the Steel City went through one of the most dramatic urban renewal programs in the slum-clearance-crazed country. Huge chunks of the bustling downtown waterfront were cleared for a new park and sterile office complex, while several of the city’s most densely-populated central neighborhoods, including Old Allegheny Center and The Hill, were completely leveled, scattering many of the market’s core customers to suburbs and public housing complexes on the edges of the city. 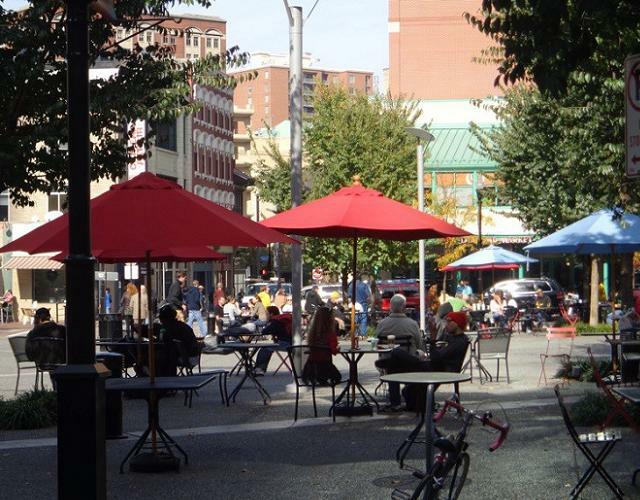 When PPS got involved in the planning process for Market Square in 2006, the site had been through numerous re-workings, none of which had managed to restore it to its former status as a gathering place for the greater Pittsburgh region. Working with the city’s Downtown Partnership, PPS facilitated a public Placemaking workshop with neighborhood groups and individuals to generate ideas for uses and activities that would inform the future design and management of the square. The process led to an opening up of the square, including the eventual closure of several streets that ran through its center, to create a more welcoming space. This created one continuous piazza-style square instead of four quadrants, putting the activity at the heart of the space rather than pushing it to the corners to make way for automobile traffic. Participants also said Market Square needed a more robust and dynamic slate of public programming. Physical changes combined with features like a farmer’s market and lunchtime concert series have helped to turn the square into an extremely popular spot for downtown office workers to gather on lunch breaks and for drinks after work. Programming, from a Carnegie Library–run reading room to the annual Zombie Fest, which celebrates the city’s status as the setting for director George Romero’s Living Dead series, has made Market Square a destination for residents across the metropolitan area as well. By focusing on programming rather than a dramatic redesign, Market Square has once again become a major gathering space for Pittsburghers. On a recent Saturday afternoon, even without any events in progress, the square was packed with people sitting, talking, playing, and enjoying each other’s company, illustrating the spillover effect of great public space management: once people have reasons to visit a space and experience its unique sense of place, they’ll keep finding their own reasons to come back. 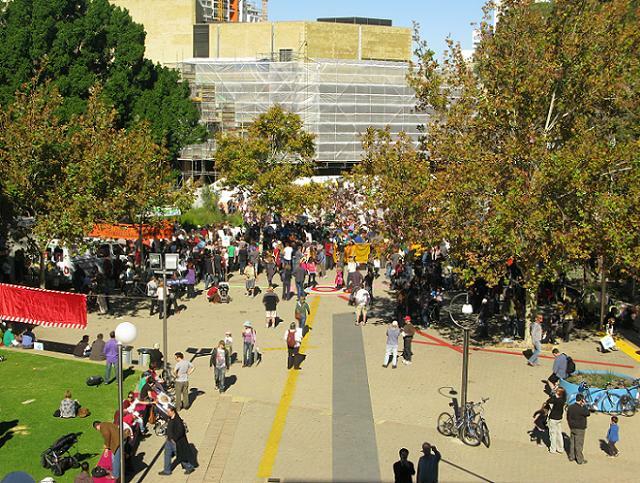 The Perth Cultural Centre (PCC) is a cluster of institutions located at the hinge point between the central business district of Western Australia’s largest city and one of its burgeoning nightlife districts, Northbridge. It features a mix of historic buildings from the 1800s and Brutalist structures built in the 1960s and ‘70s, and includes art museums, theaters, a history museum, a major library, and a compact college campus. When it came time to revamp the PCC in 2008, the Metropolitan Redevelopment Authority (MRA) decided that they would work to connect the 23 institutions within the precinct to each other by improving the public spaces that surrounded them, and to extend the precinct past its formal edges, with cultural activity reaching out into the surrounding area like an octopus. But these myriad spaces were no-go zones for many residents due to poor visibility, lack of activity, and public perception of the PCC as a high-crime area after dark, so the MRA reached out to PPS in 2009 to lead a Placemaking process to determine how the staid grounds could be turned into a series of lively public gathering places. The MRA’s understanding of the importance of careful management and cohesive vision proved to be key to changing the public’s perception of the space in a very short period of time. “Ultimately, the centre is a public space,” says Jeffery. “We want everybody to feel comfortable here.” The MRA’s willingness to try new things and actively work with a variety of organizations and local constituencies has made the PCC into the kind of place where locals feel that comfort and sense of attachment—because it directly represents their needs and interests. Currently, PPS is working with UN-Habitat to adapt the Placemaking process for use in developing world cities and towns. One of the first projects that we are undertaking through this partnership is a slew of Placemaking workshops in Nairobi, Kenya, where the mayor has promised to create 60 new public spaces around the city in the next five years. This is no small feat in any city, much less one where a full half of the population lives in informal settlements and slums, on just 5 percent of the land area. The spaces created will undoubtedly be filled with people due to the density of human life here, but a truly successful place is not just a busy space, it is a great destination. Creating destinations that people choose to go to, rather than just spaces where people go out of necessity, is an ideal way to improve the quality of life for people living in slum settlements. Public spaces in these areas can serve many necessary functions: as marketplaces, as places for getting water, as hubs for social services like healthcare and education. But the concerns in these areas are often very different from those that might be found in more established cities in developed countries. Safety, especially for women, is a major factor. And as always, the people who understand the problems that need to be addressed are the people who are already using the spaces. 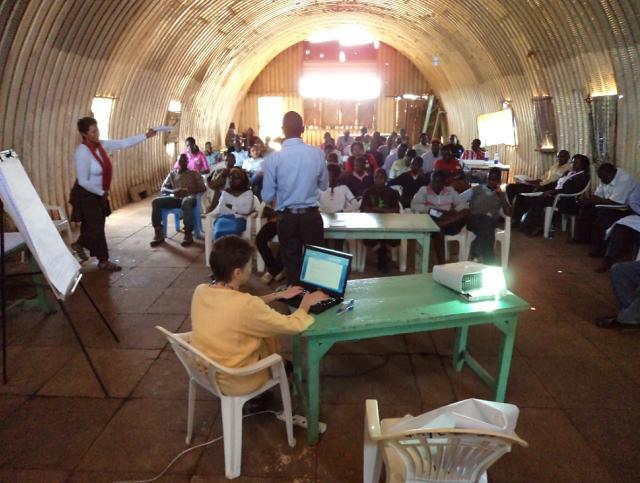 During the first Placemaking workshop Nikitin led with local residents in the spring of 2012, Silanga residents were encouraged to participate in creating a long-term plan for the site. They voiced a strong interest in improving safety in their community, which led to a plan that incorporates environmental improvements and a slate of programming for children and families that are specifically geared toward making the field a place where everyone can feel safe. The process illustrated the true value of a great third place in any community: a sense of community ownership and control of one’s place in the world, which can be expressed in the way that people engage in discussion and collaboration around a site plan, long before permanent changes to that site are implemented. In fact, the kinds of great community third places that build social capital and encourage people to take an active role in the daily life of their neighborhood are often smaller, more manageable spaces like community gardens, street corners, and schoolyards. These hubs provide places for people to gather and organize, and are vital to building constituencies for broader efforts to create more equitable cities. This is not necessarily an expensive or labor-intensive process; it merely requires the people who are currently “in charge” of a given space to step out of the way and let the people who use it play an active role in how it is shaped.